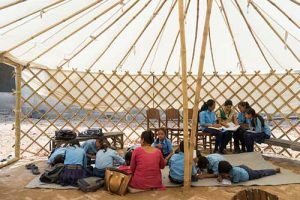 In the second of this five part series, R Madan Chief Projects Officer of The Akshaya Patra Foundation describes his first impression on arriving at Nepal to facilitate the setup of the Earthquake Relief Centralised Kitchen. Read the first part of the series here. What was your first impression on reaching the site? When I reached Nepal I saw quite a few building that were intact but as we moved in towards the towns, we began to see the devastation caused by the earthquake. 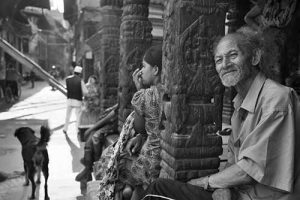 Bhaktapur which is a historical city at the heart of Nepal, where we set up the kitchen, was completely devastated. When I reached the camp I realised that unlike in other places the people from the camps were not just the financially disadvantaged, but people from different social classes who lost everything due to the earthquake. Victims were forced to leave their places and everyone went to Kathmandu under the assumption that all relief was there. They were right because relief operations could not function in other areas. There was a lot of stress and strain for the people, and emotions were high. We could see that in their eyes. Flood relief initiative – We’re serving meals in Chennai!